From the freewheeling rush of hijacking trucks to the brutal race wars that marked his decade-long stint in jail, former Mafia insider Louis Ferrante describes his remarkable journey from rising mobster to federal prison inmate to full-time writer. As Louis Ferrante tells it, the bottom line was money—and his word was good. During his teenage years, Ferrante and his crew members hijacked delivery trucks and drove them to drop-offs all over New York, reselling the merchandise and pocketing thousands of dollars per load. For a seventeen-year-old who liked fist fighting and fast cars, it was the quickest money on the street, and it soon earned Ferrante the attention of the infamous Gambino crime family, led by late Mob boss John Gotti. In the early nineties, Ferrante's growing Mafia connections enabled him to pull off some of the most lucrative heists in American history—all by the age of twenty-one. But the same handshakes that once sealed deals soon could no longer be trusted, and the betrayal by several of his close friends brought the feds banging down Ferrante's door. Symptomatic of the nation's larger crackdown on organized crime, indictments came from the Secret Service, the Nassau County Organized Crime Force, and the FBI. By 1994, Ferrante faced a life sentence in prison. He pleaded guilty and would serve nearly a decade in some of the most notorious penitentiaries in America. With raucous violence teeming around him, Ferrante relied on his Mob connections and street smarts to keep him alive—until an unexpected exchange with a guard propelled him to a painful self-reckoning: Who am I? What is it that makes me this way? Do I have a purpose? Desperate to escape from his bleak surroundings, Ferrante immersed himself in the study of history and literature. Over the term of his incarceration, each book became a much-needed sanctuary from the brutal chaos of his everyday existence, each page a challenge to his rapidly expanding knowledge of the world. Ferrante read voraciously—a journey of the mind that took him from philosophy and ancient classics to nineteenth-century fiction. He also learned the art of writing and studied the major world religions, eventually deciding to become an Orthodox Jew. And with only limited access to legal texts, Ferrante taught himself enough about the American justice system to successfully appeal his own conviction, in a case that is now cited in courtrooms across the country. Gritty and hard-hitting, Ferrante's memoir recounts his rapid rise to the upper echelons of the Mafia hierarchy, his time in prison, and his struggle to turn his life around. 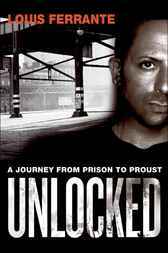 Unlocked is an astonishing journey—a true story of personal transformation that is both shocking and unforgettable.